This section provides information about the methodology of the HRIA of the Mary River mine that has been undertaken in partnership between Lloyd Lipsett, a human rights lawyer, and IsumaTV’s Digital Indigenous Democracy project. At the time of writing, the NIRB has decided that a reconsideration process is necessary in order to review the recently-proposed Early Revenue Phase for the mine. Therefore, a full and final assessment of the Mary River mine’s potential human rights impacts cannot be completed until the NIRB reconsideration process has been completed. Consequently, the preliminary information and assessment is presented as an Interim HRIA Report with the objective to contribute to further understanding and dialogue about human rights as the NIRB’s technical review and formal consultations proceed in the fall of 2013. Human rights impact assessments (HRIAs) are tools that allow stakeholders of a proposed business operation and investment to understand the potential positive and negative impacts in terms of human rights. This HRIA examines the Mary River mine and focuses on the potential impacts on Inuit and other individuals as potential employees of the mine; as members of project-affected communities; and, as potential suppliers or business associates of the mine. The HRIA also examines the responsibilities of the government and the Baffinland company to protect, respect and remedy potential human rights impacts, as defined by international human rights law and compared with good practices for the mining industry. •	To assess the risks (potential negative impacts) and opportunities (potential positive impacts) for human rights for the Mary River project. •	To highlight the current gaps between Baffinland’s policies and procedures, as well as the government’s legal and regulatory framework, and current international human rights standards and guidance. •	To provide additional information and resources about human rights issues. Given that the HRIA is undertaken in collaboration with the Digital Indigenous Democracy project—which features engagement with Inuit in oral Inuktitut through radio and social media—additional information about the views of the affected communities is provided to supplement the on-going formal consultation processes about the proposed mine. •	To document some baseline human rights information that can contribute to the monitoring, assessment and remediation of actual human rights impacts over the life-span of the Mary River mine. To appreciate the relevance and justification of HRIAs for mining projects anywhere in the world, including in Nunavut, it is important to understand that there have been important international developments related to business and human rights over the past six or seven years. When Baffinland began exploration activities related to the Mary River project around 2004, and even when the NIRB began its review process in 2008, there was no clear international consensus about the responsibilities of businesses with respect to human rights; however, it is now impossible to deny that an international consensus exists and is gaining significant momentum. The new international consensus about business and human rights is related to the work of John Ruggie in his role as UN Special Representative on Business and Human Rights from 2005 to 2011. The key milestones in his work were the UN Human Rights Council welcoming the Protect, Respect and Remedy Framework in 2008 and endorsing the UN Guiding Principles on Business and Human Rights in 2011. The key points related to the UN Guiding Principles are outlined in the different sections of this report. To date, the majority of HRIAs of mining projects have been undertaken after operations have begun—often when human rights violations have been alleged and/or social conflict has emerged. This frequently can result in a degree of tension and suspicion around the HRIA between different stakeholders. The HRIA of the Mary River mine was undertaken prior to the approval of the Project Certificate and the construction of the mine (i.e. ex ante rather than ex post assessment). Throughout the assessment, stakeholders expressed their points of view, expectations and concerns about future impacts rather than current or historical impacts. Apart from the issue of prior consultation with indigenous peoples, the vast majority of the human rights issues discussed in the HRIA are discussed in a forward-looking manner. Care has been taken to not make allegations about violations of human rights. Rather, the HRIA seeks to identify areas of human rights risk and opportunities for improvements to human rights. The working premise of a forward-looking HRIA is that addressing human rights issues proactively and in dialogue with all the relevant parties and stakeholders is the most effective way to prevent negative human rights impacts from occurring in the future. As the experience demonstrates, ex ante HRIAs can provide some additional advantages to ex post assessments. In particular, this HRIA has benefitted immensely from the opportunity to engage in the formal environmental and social impact review process conducted by the Nunavut Impact Review Board (NIRB). As noted in the HRIA timeline, Lloyd Lipsett and Zacharias Kunuk were granted formal intervenor status by the NIRB and participated in their final hearings in Iqaluit, Igloolik and Pond Inlet. This allowed the intervenors to provide observations and recommendations to the NIRB on the record. It also permitted the intervenors to hear the presentations, questions and answers of all the parties and a wide spectrum of stakeholders who participated in the community roundtables. The parties and formal intervenors in the NIRB proceedings provided their information under oath and were subject to questions from the other participants. The proceedings were recorded and a transcript has been prepared. IsumaTV filmed the hearings and excerpts have been uploaded to their website. Engagement in the NIRB review process provided clarification of the detailed technical information about the mine’s plans, as well as to hear the full range of points of view about the proposed mine. The assessment has been undertaken through a participatory process where all stakeholders were invited to present their views. The HRIA benefited from formal participation in the NIRB public hearings and audio and video clips of these hearings are included as multimedia resources on the HRIA website. Given the partnership between the HRIA and Isuma TV’s Digital Indigenous Democracy project, digital media, video and radio was used as much as possible in order to provide information about the Mary River mine and relevant human rights issues, as well as to encourage broad participation in the NIRB public hearings. The basic premise is that audio and video can enhance communication and help respect the language, oral tradition and cultural rights of the Inuit. •	A series of “inform and consult” radio shows hosted by Lloyd Lipsett and Zacharias Kunuk and featuring presentations by the NIRB, the QIA and various experts and a call-in segment for community members. •	Video interviews with elders in Igloolik. •	“My Father’s Land”: multimedia submission by Lloyd Lipsett and Zacharias Kunuk to the NIRB. •	Filming the public hearings in Iqaluit and Igloolik. •	Broadcasting the public hearings in Igloolik and Pond Inlet on the community radio and over the Internet. •	Community radio updates about the public hearings in Iqaluit and Pond Inlet. •	Video presentation by Zacharias Kunuk for closing remarks at the public hearing in Pond Inlet. Many of these multimedia resources are referenced throughout the HRIA. Moreover, the publication of the final HRIA report on the Internet in a multimedia format is designed to enhance the transparency of the assessment’s methodology, findings and recommendations. The use of multimedia tools for on-going information and consultation with Inuit communities over the lifespan of the Mary River mine was one of the main recommendations made by Lloyd Lipsett and Zacharias Kunuk in their submissions to the NIRB. The NIRB discussed this in its Final Hearing Report and addressed this with one of the terms and conditions in the Project Certificate. As discussed in the submission to the NIRB hearings, IsumaTV offers its media expertise and network of community media players and radio stations for future efforts to enhance consultation about the mine. Rights-based assessment methodologies emphasize the importance of participation of affected stakeholders, as well as transparency and accountability. While this was a limited example, the use of multimedia in the conduct of the assessment was an experiment in ways that stakeholder participation can be enhanced. In the context of Nunavut, the use of audio and video media provided additional possibilities to address the challenges and complexities of translation and respecting the oral tradition and language rights of Inuit. At the same time, the accessibility and cost of the necessary Internet technologies remain a barrier to their effective and systematic use throughout Nunavut (and in other indigenous communities). It is hoped that the Mary River mine will contribute directly and indirectly to the development of improved internet services and communications infrastructure in the Baffinland region that will be useful for the mine but also accessible for communities. This can be one of the immediate and lasting benefits as the mine is developed. 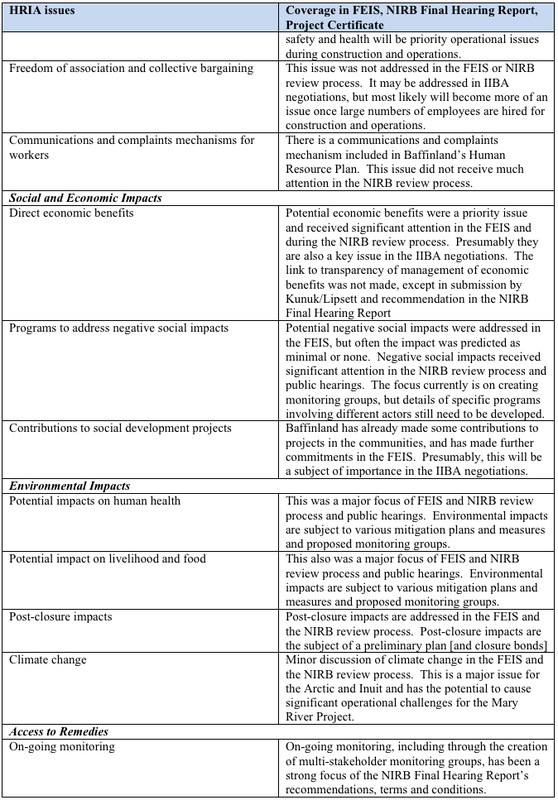 The NIRB review process is focused on the Environmental Impact Statement prepared by the Baffinland company (and now on the Addendum to the Final Environmental Impact Statement for the Early Revenue Phase). These are a very detailed document that contains the company’s policies, management plans and mitigation measures to address risks to the environment and to communities. HRIAs have evolved out of the methodologies and established practice for environmental and social impact assessment (ESIA) since the 1970s. 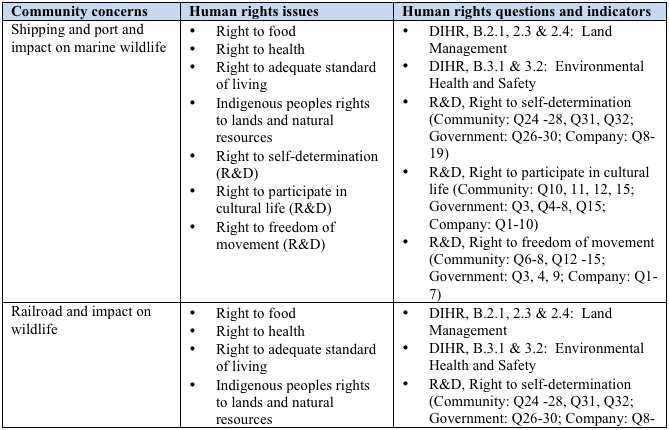 However, HRIAs differ from environmental and social impact assessments as they explicitly focus on international human rights standards, and stress the importance of rights-based methodologies for the conduct of the assessment. For instance, many of the issues covered in the FEIS and the Addendum are relevant to human rights, but are not expressed in human rights terms. In particular, the term “human rights” only appears 3 times in the thousands of pages of materials contained in the FEIS. Currently, the question seems not whether or not human rights are relevant to ESIAs, but rather whether human rights should be integrated into existing environmental and social assessment and risk management processes, or should be undertaken as “stand-alone” HRIAs. This issue is also explored in the recently released (March 2012) guide by the International Council on Mining and Metals entitled “Integrating Human Rights into Corporate Risk Management Processes.” After discussing the necessity for mining companies to consider human rights as part of their risk management processes, including the conduct of ESIAs, the ICMM considers that there are three basic options that can be pursued: (1) build human rights into the ESIA; (2) conduct a separate assessment focused on a particular human rights issue or set of issues that have been identified as significant in previous assessments; or (3) conduct a stand-alone human rights impact assessment (HRIA). This approach of including human rights within environmental and social impact assessment processes is also endorsed by ArcellorMittal in its Human Rights Policy, which should be implemented at the Baffinland mine. The guidelines for the preparation of the Mary River FEIS precede ArcellorMittal’s Human Rights Policy and some of the international standards about business and human rights; and, therefore, it is understandable that human rights were not addressed more explicitly in the FEIS. Consequently, one of the main recommendations of the HRIA is that Baffinland should implement a formal human rights policy and due diligence measures on a going-forward basis. Similarly, it is recommended that the NIRB include human rights in its project review guidelines for future mining projects in Nunavut so that project developers will address human rights more proactively and explicitly. 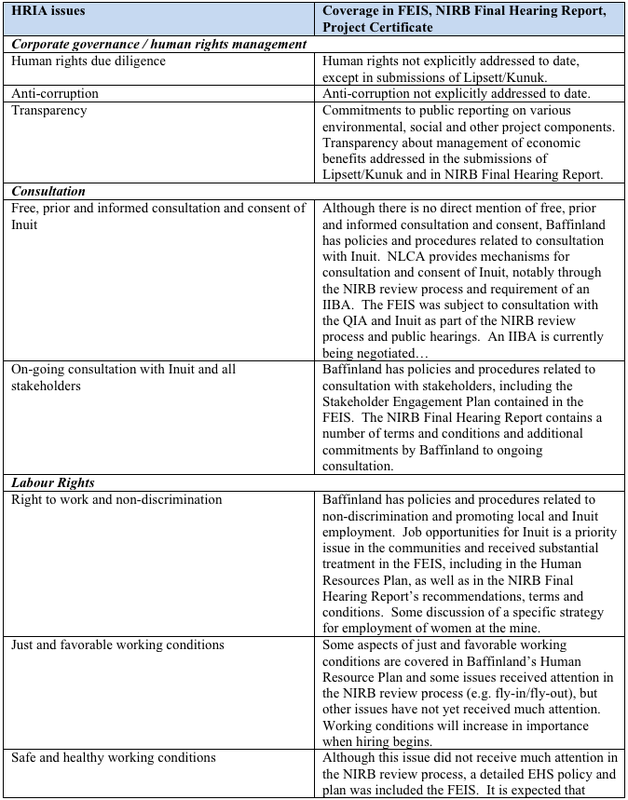 As noted above, many human rights issues have been given attention in the NIRB review process implicitly in relation to social, economic, environmental and governance issues discussed in the FEIS, the submission of the various Parties and the NIRB’s Final Hearing Report). However, by applying a human rights lens—including through the application of human rights impact and compliance assessment tools—there are additional issues that merit further attention, including some of which will likely increase in importance when construction and operations begin at the mine. The HRIA made use of a number of human rights impact assessment tools to conduct the preliminary analysis of human rights issues and to identify relevant indicators for assessment and monitoring. In particular, the HRIA applied the Danish Institute for Human Rights’ “Human Rights Compliance Assessment Quick Check” tool and Rights & Democracy’s “Getting it Right” guide. The following table presents an overview of this part of the HRIA process. 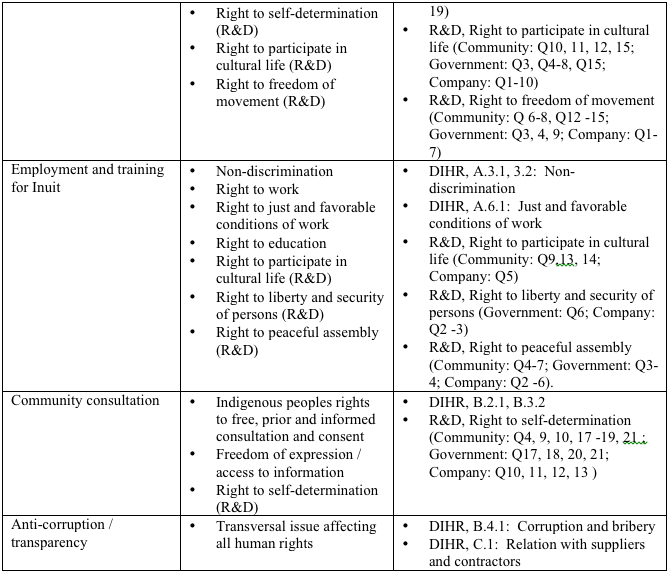 Further information about the various human rights issues can be found in the other sections of the HRIA.